I read the methods section Math notes: how PL is calculated in HaplotypeCaller which says that PL is based on the probability of the genotype given the data. Does this mean that it includes the product of the genotype likelihood and the prior probability of the genotype and therefore is it actually the (unnormalised) posterior probability not a likelihood? (I realise that the prior is by default flat but that it can be altered). It then describes GQ as the ratio of the probability of the second-most probable genotype to the called genotype (if these are probabilities). Can you please explain how this equates to the probability that the genotype as been wrongly called given that the site is variant (from the VCF format specification). It doesn't take into account the probabilities of other possible genotypes and I don't understand how it is conditional on the site being variant. As an example, what about when the second-most probable genotype is homozygous reference. As far as I understand it, per event, the genotype likelihoods are multiplied by their priors and divided by the sum of all the likelihoods to give us genotype probabilities. The priors in HaplotypeCaller are flat. Another tool, CalculateGenotypePosteriors, uses actual priors based on population allele frequency to calculate genotype probabilities. It emits a metric called Phred-Scaled Posterior Probability. To distinguish the metrics output by these tools, for the purposes of HaplotypeCaller, we refer to the genotype probabilities we’ve calculated using flat priors still as likelihoods. 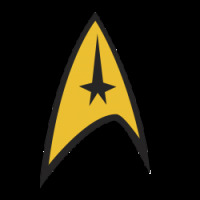 We shorthand the phred-scaled likelihood to PL. Again, the PL is the normalized Phred-scaled probability of each genotype. GQ is the genotype quality and is the smaller of the 2nd PL or 99. I hope this clarifies your questions. If you can, you should attend a GATK workshop or at the least check out our workshop materials, which we make freely available online. Our blogs point to the latest workshop materials. If you google "YouTube, Broad and GATK", there should also be some videos that walk you through the presentations. Thank you for your answer shlee. You didn't answer the part about whether GQ is how it is defined in the VCF format. I don't see how it is conditioned on the site being variant. Could you please look at that part again? We log 10 transform the probability and multiply by -10 to obtain raw PLs (middle row). 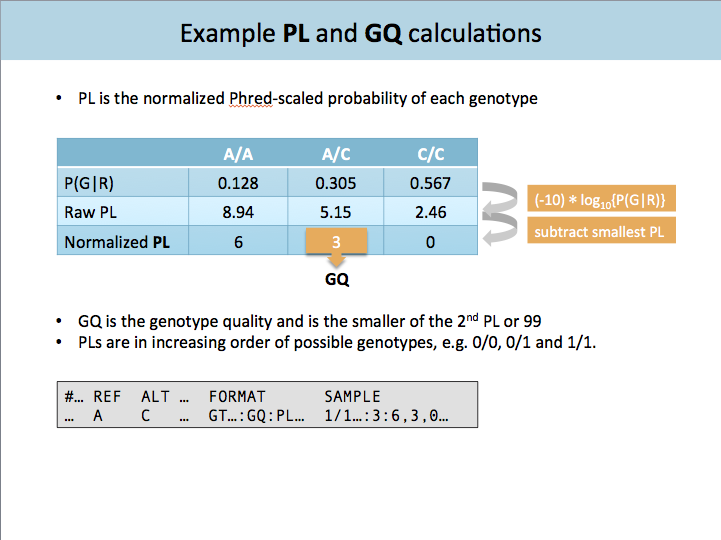 We then subtract the smallest PL from each raw PL so that the most likely genotype's PL is zero (last row). The distance to the next most likely genotype is the next most likely PL. The genotype quality (GQ) captures this distance. That is, the GQ is the PL of the next most likely, capped at 99. Remember @Lucy_gen , low GQ does not necessarily mean a bad variant call. You can have a good variant call with a low GQ. That is, we can be sure a site is not hom-ref, but not be sure whether it is het or hom-var. To be more specific, I expected that the GQ should be calculated as something like (1-posterior probabilty of called genotype)/(1-10^-QUAL/10) i.e. the probability that the genotype call is wrong divided by the probability that the site is variant. I think in the past GATK did have a calculation more like this, which seems to be closer to the definition in SAM format. I think this article and this article should help.